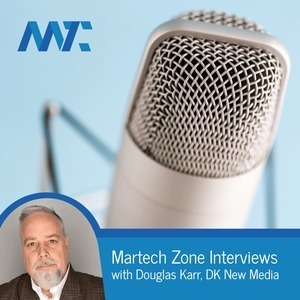 We found 10 episodes of Martech Zone Interviews with the tag “karr”. In this Martech Zone Interview we speak to Jaime Bettencourt, the SVP of Premier Sales & Account Management for Mood Media on the Impact of Sensory Marketing in Retail. In this Martech Zone Interview, we speak to Randy Frisch, Co-Founder, CMO and President of Uberflip. Randy returns to the podcast to discuss his new book, F#ck Content Marketing. In this Martech Zone Interview, we speak to Mike Reynolds. Mike has been ideating and delivering digital products to market for over 20 years. He is an expert in product management, user experience, and product marketing. In this Martech Zone Interview, we speak to John Koetsier. John is the leading futurist who analyzes trends and predicts futures. Today we speak to John about the importance of mobile to every digital marketing strategy. In this Martech Zone Interview, we speak to Jon MacDonald of The Good. Jon's conversion rate optimization firm has achieved results for a variety of clients including Adobe, Nike, Xerox, and The Economist. In this MarTech Interview, we speak to Fernando Angulo of SEMrush. Fernando is actively involved in the search marketing world and a regular speaker at Digital Marketing and Ecommerce conferences and events. In this episode, Fernando discusses findings on mobile versus desktop behavioral trends. Episode 139: Andrea Vahl: Facebook Advertising Secrets - the Book, Course, and Tips to Improve Your Campaigns Today! In this Martech Zone Interview, we speak to Andrea Vahl, the most sought out speaker and educator on Facebook Advertising and Social Media Marketing anywhere! Andrea has developed a number of courses to educate social media professionals, and has just published her latest book - Facebook Ads Made Simple. In this MarTech Interview, we speak to Kami Huyse. Kami is a digital strategist who helps companies build online communities that convert. She's the CEO of Zoetica, an author of multiple marketing books, a podcaster, and public speaker. In this MarTech Interview, we speak to Neil Crist, the VP or Product and Engineering for Moz. Moz is a leading platform and community of local, organic search optimization tools and professionals. Neil reveals findings from their State of Local SEO report. In this MarTech Interview, we speak to Steve Woodruff, author of the newly published Clarity Wins: Get Heard. Get Referred. Steve shares industry feedback and actionable advice that motivated him to write the book.